We are happy to announce the launch of “Calling Records”, that is probably the first Japanese record label which focuses on “Christian Rock” exclusively. Calling Records is established by 3 people, Tak Nakamine from Imari Tones, Hiroki Miki from CLOD, and Shinichi Ohara from Soul of Faith. 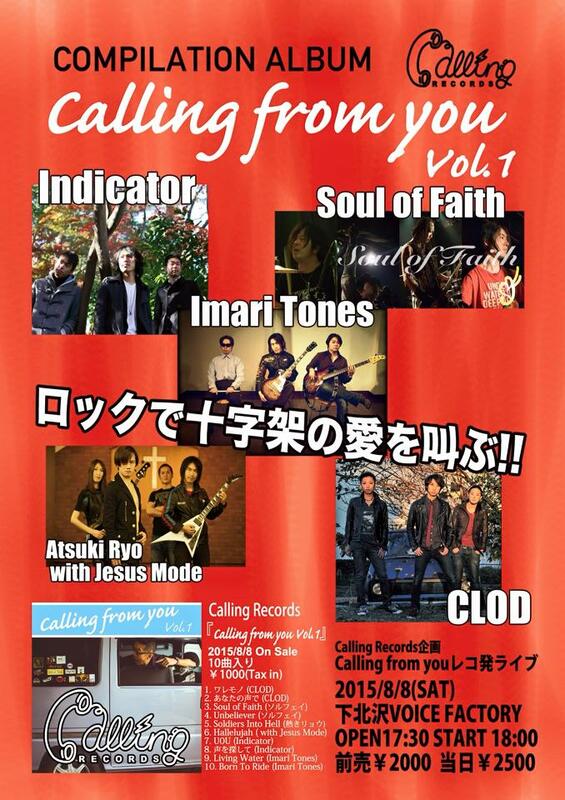 As the first product from the label, Calling Records will release “Calling from you Vol.1”, which is a compilation album contains 10 songs from 5 Japanese Christian bands – CLOD, Soul of Faith, Atsuki Ryo with Jesus Mode, Indicator, and Imari Tones. CD release party/gig is planned on 8th August Saturday, at Shimokitazawa Voice Factory, Tokyo, Japan. The CD will be available on BandCamp and other online outlets accordingly. This is a very positive news. Not like “major industry breakthrough” but it will have a positive impact on Japanese Christian music scene in a long run. These Japanese Christian bands united and working together, it means more power, more love and more music. This is a new born hope for still very small Japanese Christian rock music scene. Please check the CD when it’s released. Please come to the CD release gig if you are in Japan. Also please like Calling Records’ facebook page.